I wanted to mention another big plus of the Sizzix die cutting system today, their clear dies. 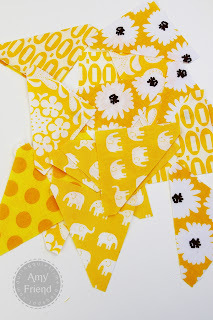 I was using one today, the half square triangle, to prepare more blocks for my bee month in the Stash Trad Bee. 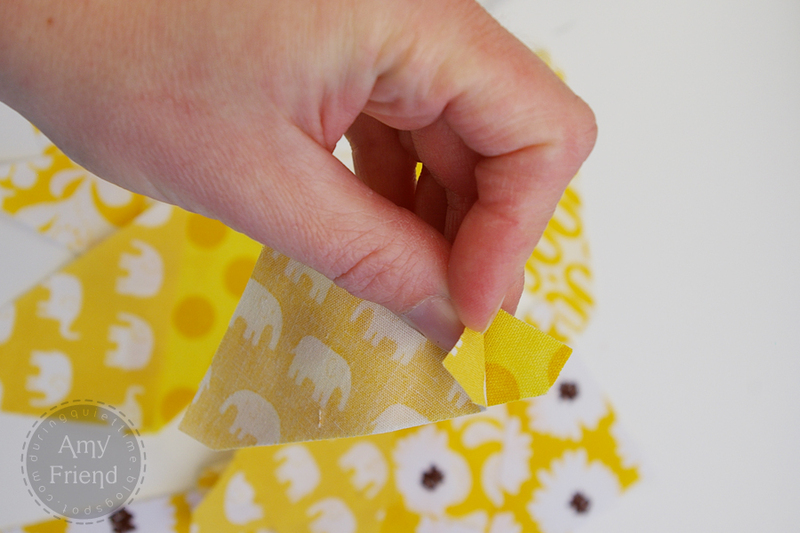 As you can see in this shot, the die is clear which allows you to monitor your fabric placement. 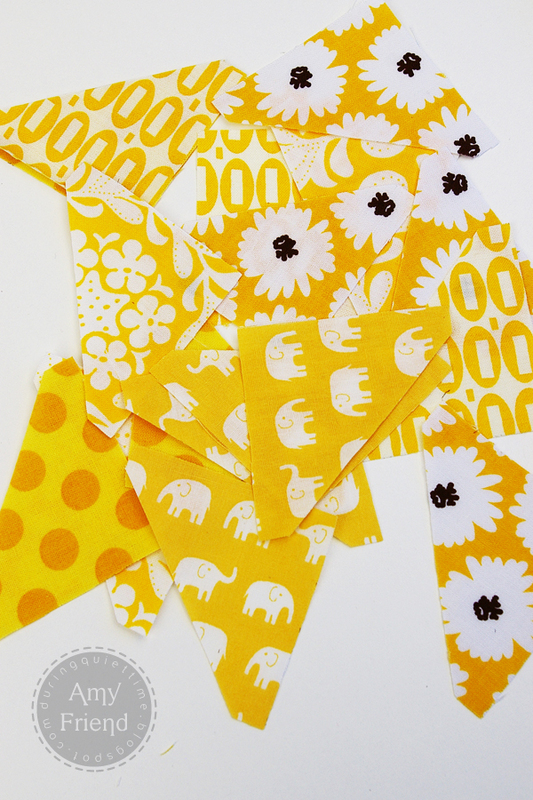 I put down one cutting pad, then my fabric right side up, then the die cutting side down. I then moved it around a bit so that I could line up the rows of elephants. I then placed my other cutting pad on top and flipped the unit over and ran it through the machine. I did it again here to get the rows of pez lined up nicely. The clear dies are helpful if you like to see the grain of the fabric when you cut, if you want to keep patterns lined up evenly, or for fussy cutting. Fussy cutting isn’t too common with HST units but the square, circle, rectangle and many other dies are made clear as well. I know I love to fussy cut squares and circles in particular. As with most die cutters, I find that you get the best results when you stack a number of pieces of fabric. The cut seems to be more complete that way. So with just one pass through the machine, I got this nice little stack of HST. As you can see, they have dog eared corners so you can match up two triangles and sew your 1/4″ seam for a perfect, square HST unit with no trimming. I often get asked if there is a lot of waste using the die cutter. Sometimes I have to admit that there is more than using a rotary cutter. I don’t think that there is in this case. When I create traditional HST units, I always make them larger and trim down. That creates waste and also takes a lot of time. This method creates a little bit of waste as well but saves a ton of time. While I had the Big Shot out, I cut some more felt with my daughter to make a set of headbands. She has another birthday party to attend. I can tell that this will be my go to gift for years. 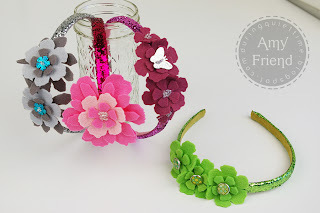 They are just so fun to make and there are so many ways to embellish! This time I used glitter laden headbands from Target. We cut felt in matching/coordinating colors. The green headband uses Basic Grey glazed buttons. We used clusters of glass beads in the center of many of the flowers, as I did last time. This time, we added sequins into the mix as well! These were made with the Tattered Florals die. 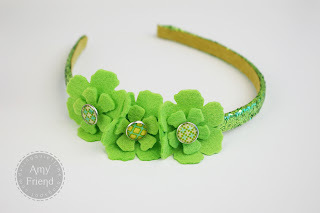 You can see my last headband making post here. 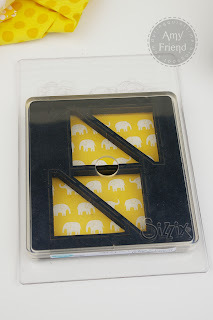 At the beginning of next week, I will have my first tutorial up on the Sizzix blog! I am looking forward to sharing it with you.